On this cycle holiday you will discover the coast of Corsica as well as its interior. The kilometres follow one another but they are far from being the same; with different landscapes every day. You will meet proud island inhabitants who will want to share their enthusiasm with you for their local culture and gastronomy. This is a great trip that will leave you with fantastic memories of Corsica and will make you want to return for more! You will be accommodated in carefully selected hotels, rooms in a guesthouse or inns according to the availability at the time of the reservation. This is A MUST-DO in Corsica ... Suitable for all levels, you will discover all the wonderful places throughout the week, between sea and mountains ! - Bastia - Your holiday starts in Bastia at your hotel in the afternoon. If you have time to discover the capital of "Haute Corse", it's worthwhile visiting the old port and the citadel. From the old city there are wonderful panoramic views over the sea and surroundings. For dinner, we advise you to go to the old port which has a very lively atmosphere in the summer. Night in Bastia. 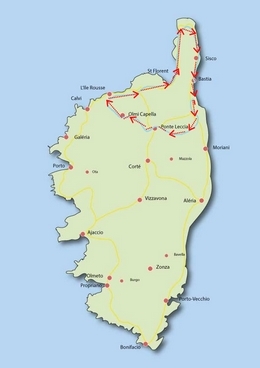 The Cape of Corsica - Riding distances: a choice of two routes, approximately between 59km and 79km. This morning you'll pedal along the east side of the Cape of Corsica, only a stone's throw from the sea. You'll then cross the island to join the West coast of the Cape with its dramatic cliffs. The route is strewn with Genoese and Paoline towers as well as old convents and mills. The landscape, including the small fishing ports is splendid. Night stay in a charming village. The Desert des Agriates.Riding Distances: a choice of three, approximately 48km, 69km or 80km. Today you are in the heart of the Desert des Agriates. From hamlet to hamlet, you cross this superb 'desert' covered in the local maquis scrub (which has a fantastic smell and is amazing in the spring when the maquis is in blossom). Back to the coast where you will soon reach your accommodation, not far from Ile Rousse. Night in a village near to Ile Rousse. Villages of Balagne --Riding Distances: approximately 30km, 44km, or 57km.---- Today you'll explore the pretty villages of the Balagne. This area is bewitching. The stone villages perched in the middle of nowhere have an astonishing beauty which hasn't changed with time. Night in the mountains. Descent in Castagniccia----.Riding distance: approximately 34km, 53km or 57km----. Your last day of riding will take you either through the villages of the Nebbiu region or through the Castagniccia region, both known for their chapels and the chestnut forests. Royal Milan (Red Kites) are widespread in this area; you are likely to see them hovering over your heads. Your stop for the night will be in a village close to the airport. End of stay. After your breakfast, a transfer can be organized towards the airport or the ferry port. End of holiday. Double room : 790 euros per person. Single room : +330 euros per person. The transfer of the luggage, local assistance, nights in double rooms in inns, hotels or guesthouses, Bed and Breakfast. the optional activities and the personal expenses. LEVEL OF DIFFICULTY This program offers you the choice of distance you wish to ride each day, however, please be aware that on all routes there are a lot of hills! You can adapt the stages to your ability. The distances vary from a minimum of 30km to a maximum of 80km. 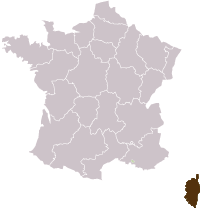 The longest minimum stage is 63km. The first stage is the longest, but also the easiest in terms of terrain. CARRYING The transfers of your luggage is ensured by vehicle. Thus you only have to carry your things needed for the day.